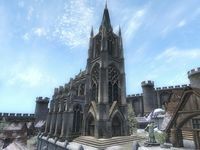 Great Chapel of Talos is in the southern end of Bruma, between the Jerall View Inn and Olav's Tap and Tack. This chapel specializes in Agility and Strength. The building is divided into the Great Chapel of Talos, the Chapel Hall, and the Chapel Undercroft. A few minor changes are made to the Great Chapel of Talos with the Knights of the Nine official plug-in. These are described below. The three front doors of the chapel lead into an entrance two steps higher than the main room ahead. A staircase in the middle of the entrance leads down to a small hallway with three doors. The two by the west wall reveal the Undercroft and the one on the east wall leads into the Chapel Hall. The cathedral altar is at the end of the room, and nine altars - one to each of the Nine Divines - line the room. In the main room of the Chapel Hall are two food barrels in the southeast corner, two more in the northwest corner, and another in the northeast corner next to two food sacks. A copy of 2920, Hearth Fire sits on the bookshelf in the northwest corner, and the two wine racks in the northeast corner hold a total of 20 bottles of cheap wine. Two loaves of bread, two bottles of Surilie Brothers Wine, and a bottle of Tamika's West Weald Wine sit on the table in the middle of the room. Through the doorway on the north wall, a set of stairs to the west leads down to Cirroc's room, with a single bed in the southeast corner. The chest next to the head of the bed contains clutter, and on top of it sits a bottle of Surilie Brothers Wine. The cupboard on the curved west wall contains clothing, and the desk next to it contains clutter and/or a common book, with a loaf of bread sitting on top. The set of stairs to the east leads down to Arentus Falvius's room, with a single bed in the southwest corner. The chest next to it contains clutter. The cupboard in the northeast corner contains clothing, and the desk on the east wall contains clutter and/or a common book. The door on the north wall beyond the main entrance room leads to Isa Raman's bedroom. Her double bed is against the north wall. The chest of drawers on the east wall contains clutter, as does the chest on the west wall with two bottles of Tamika's West Weald Wine on top and the chest on the south wall next to the door with two pumpkins on top, as well as the desk in the southwest corner with two apples on top (which may also contain a common book). The cupboard in the southwest corner holds only clothing. In the main entrance of the undercroft, a skeleton lies in the northeast corner, and another in the southeast corner. There are four tombs along each side of this room, with a ninth opposite the doors. From the entrance, the third tomb on the right has a ledge that holds a jewelry chest and a sample of sacred lotus seeds. The doorway on the west wall leads down to a small room with three tombs, two altars, and a drain in the middle of the floor. The doorway on the east wall leads to an exact mirror image of the previous room. With the Knights of the Nine plug-in, one of the books on the table in the middle of the Chapel Hall has been changed, and it is now The Adabal-a. The other book on the table is now Shezarr and the Divines. On the bookshelf with the skill book, there is now also a copy of The Knights of the Nine and The Song of Pelinal volumes 1-5. Volume 7 can be found on the chest beside Cirroc's bed, and Volume 8 is on the bench next to Isa Raman's bed. This page was last modified on 11 November 2018, at 19:45.